Are you spoiling your kids rotten? If your kids are demanding, self-centred and ungrateful, yet you continue to give in to their every desire, you might be. If you set limits and model gratitude and kindness (as often as you can, obviously—some days I’m an ungrateful hag) you’ll be rearing awesome little citizens who will take what is bestowed upon them with genuine appreciation. Sincere ‘please and thank yous’ go a long way. I tell my kids that people want to do things for them because it makes them feel good. By acknowledging somebody’s generosity, you make them feel even better. Friends and family will want to spend their time and energy on them because feeling good is addictive. It really is satisfying to do something thoughtful for another person—whether it’s making them a special card, sharing a favourite toy, or giving a compliment. It just feels nice. Humans are hard wired to constantly seek pleasure. That’s biology. She was thrilled. And guess what? She baked them another loaf the next time they came over. Nicely done kids… lemon loaf left-overs for mummy! Sometimes sweet behavior begets sweet treats. Before you argue that I’m teaching my kids to be annoying little goody goodies. The key is sincerity. Nobody appreciates a fakey fake face. Be real or don’t bother. Is it possible to spoil a kid rotten? Sure, if rotten means selfish, greedy, needy, lacking in self-confidence, etc. I try to spoil my kids awesome instead. I love spoiling them with little surprises like random notes in their lunches or a special piece of art for their wall, made by me just for them. (Crappy art that looks like it was painted with my feet, but they don’t care.) Or this craft disaster. We show them how to collect things around the house to donate to the Salvation Army, or daddy helps the kids bake a pie to surprise me with on my birthday—it’s the little every day things that teach so much. 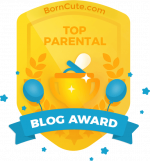 And here’s another SUPER EASY—albeit sneaky—way to spoil your kids awesome. Sometimes when I compliment my son he’ll say, “You’re just saying that because you’re my mom.” Praise seems easier to accept and believe when it’s indirect. Just a theory. My son heard. I’m sure of it, because the next morning he cracked a joke at the breakfast table and puffed up like a proud punny peacock when I busted out laughing. 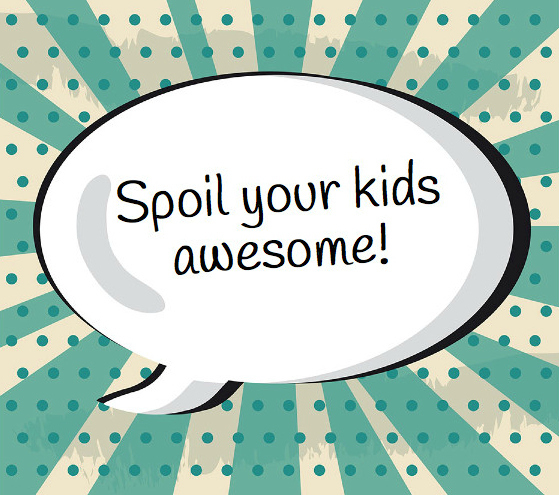 So go ahead and spoil your kids awesome. Do it for you (because it feels amazing to watch your children happily thrive and develop into awesome people). Do it for all of us soon-to-be elderly folks who will be relying on Generation Z to look after us in our golden years.